This F1 championship battle seems determined to fox us. In many ways this one at Monza was a lot like the one at Spa a week before. A high speed track that we thought could be designed for Mercedes. Indeed it's likely so to an even greater extent than the Belgian track - plenty of long straights to show its top end grunt; few corners that Ferrari can catch up in. Merc's trimmed set up appears the more efficient too. 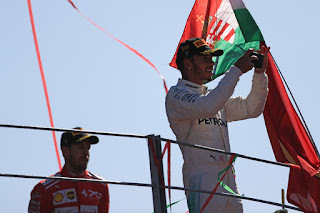 And the winner was as expected - Merc's very own Lewis Hamilton. Highlighting the ebb and flow he thus became the first back-to-back winner this season. With it he took the title lead for the first time. But just like in Spa the significance for plotting the championship destination laid instead in the margin of the victory. Only this time the other way around - this time Merc was even further ahead of Ferrari than anticipated. Spa titled predictions towards Ferrari and Sebastian Vettel; this one titled them back. Qualifying was delayed and run in heavy rain plus - in an unrelated factor - almost half of the pilots had penalties for changing gearboxes and engine parts. But come the end of this short quick race no one was pointing at this starting order jumble as an explanation for the result. One part of the grid was utterly standard. 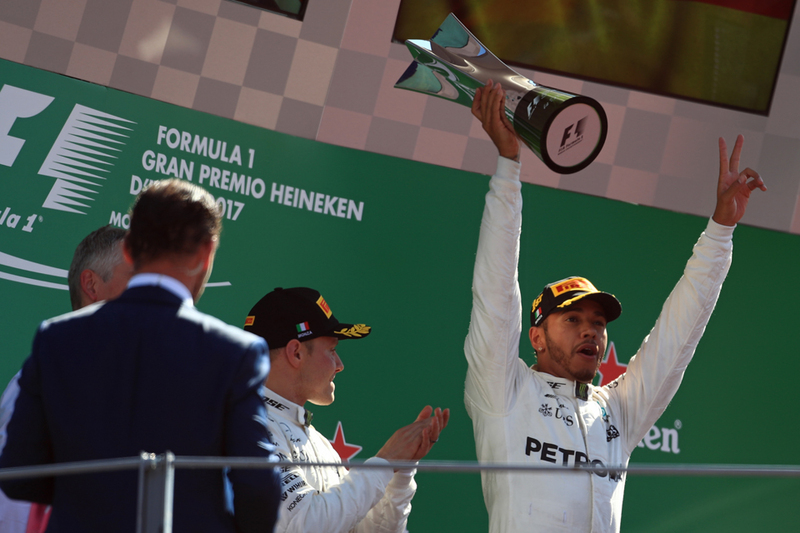 Lewis bagged pole impressively in the teeming conditions, and this one meant he became the most numerous F1 poleman ever. And as far as everyone was concerned if Lewis led off the line that would be that, as his most likely rivals on pace had cars to clear. He did lead off the line (after a detour to deter surprise fellow front row man Lance Stroll) and that was indeed that. Quickly there was order from the chaos. After just eight laps we had the ever so standard looking top three of Lewis, the other Merc of Valtteri Bottas (who'd started fourth) and Seb (sixth) in that order. The day was framed from there. Valtteri gave good chase of his team mate, but tended to hit the usual dirty air buffer in another's wake. 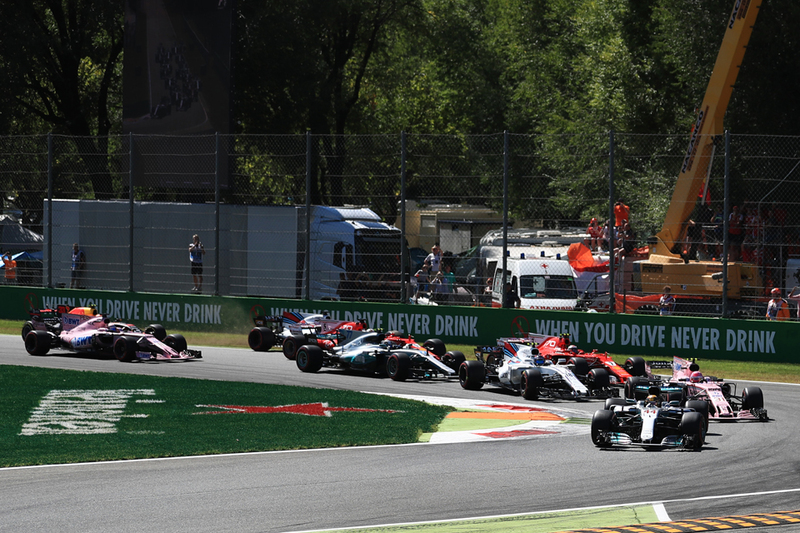 Plus overtaking at Monza is oddly rare. The Mercs finished in formation at the front. And as intimated it was not a good day for the home team. Especially as even from that eighth lap Merc streaked clear of Vettel easily; even when in cruise mode from around quarter-distance. Come the end Seb well upwards of half a minute adrift. A far cry from his fevered chase in Spa. "Not sure why the pace of the Ferraris was closer [before], especially in practice," said Lewis afterwards. "Today the car felt fantastic, particularly on the first stint - I guess because we had a bit of breathing space, it was easier to extend the life of the tyre. "Valtteri did a fantastic job to get through and to get a 1-2 here. "I know it is not easy for the Italian fans to accept but ultimately we did a better job this weekend as a team, but it is still close and a long way to go." It might have been worse for the Italian fans. Red Bull without its own penalties would have started second and third and probably would have finished ahead of the red cars. 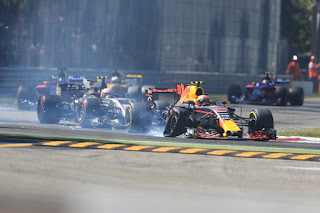 Daniel Ricciardo even from starting 16th split the Ferraris in fourth by the end and was harassing Vettel late too. He likely was driver of the day. 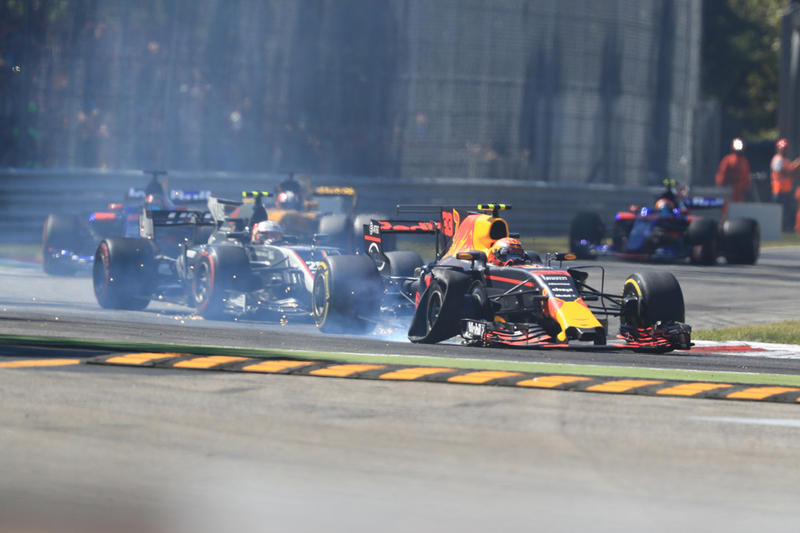 Max Verstappen would at least have been somewhere in the mix as well but his wretched luck of 2017 continued, as he picked up a puncture early in battle with Felipe Massa. He recovered to take the final point though. Adding to Ferrari's woes, its abrasive president was none too complimentary in public afterwards. Vettel though was more positive. "Even if this race has been difficult I know that we have a very, very strong car and we will have a very, very strong end to the season, I'm sure of that," he insisted. As expected those who benefit from Merc power as customers also showed up well in this one - Esteban Ocon put his net third on the grid to good use (as well as put the Spa controversy behind him) by coming home sixth for Force India, and Stroll did similar to bag seventh, though he had to hold off his team mate Felipe Massa on the final tour in a frenzied battle. The other Force India of Sergio Perez got ninth. As noted Lewis now leads the table for the first time. But again in keeping with the year no one is jumping to conclusions. Particularly as Singapore is next, where Ferrari is expected to be on top. "It's still close and there's still a long, long way to go," cautioned Lewis. 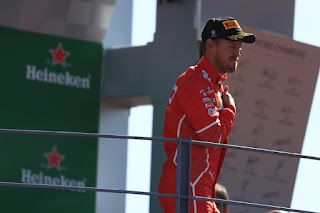 "We're going to another track next that the Ferrari should be quite quick at, with the extra downforce they generally are able to add on, so the fight will continue. "But it is amazing to come and have the back-to-back wins. It's been a long, long time that Sebastian has been leading the championship, so with all the ups and down to now be just slightly ahead is a great feeling." And note again what was said at the outset about this F1 title fight. You'd be well served not to project too far ahead. "I don't really care what's written on the paper," said Vettel on the upcoming rounds. "They're all tracks that I like, so I'm very much looking forward to them. "At the moment you can say that Mercedes has an edge. Saturdays they're very strong which obviously has its contribution to Sundays, it's not a big secret but I think we are strong, we don't need to hide and there's plenty of positives." Vettel has lost his rhythm for sure after post race mistake in Malaysia and team definitely has Quality control issues going on also.